I sometimes forget the strength of the simple. Social media is a brawny tool, but it’s sometimes vexing to figure out the best way to reach the masses using our profile platforms. That’s why a couple of informal posts I recently put up surprised me in their reach and response. I re-learned a lesson about the power of the ask. If we make our requests without manipulation or ill motives, especially when we are inspired for a greater good, we generally receive what we ask for. 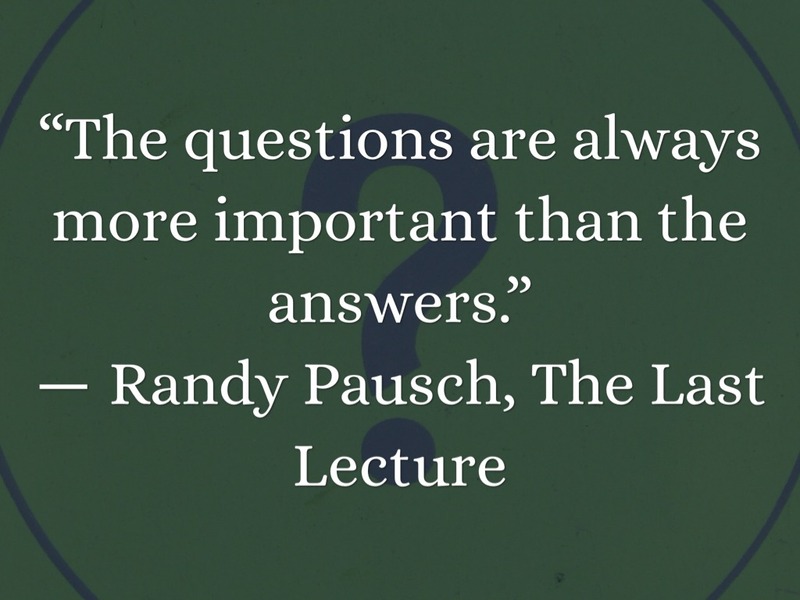 I remember a few years ago, when I read Randy Pausch’s book, The Last Lecture: Really Achieving Your Childhood Dreams, and feeling struck when he mentioned the power of simply asking as criteria for getting what we want. The world relinquished a wise and insightful man when he lost his battle with pancreatic cancer in 2008. Randy’s book was his final gift to the world. I was reminded of The Last Lecture when two different times I asked for help on my social media platforms. My intent was to help others, but as a by-product, the information I received also helped me. I believe because my questions were genuine and sincere, my friends, fans, and followers were eager to assist. First, as a favor to a friend who is an editor for a women’s magazine, I asked seven questions in order to find out what the hottest topics were for women today. Not only did the volume of answers surprise me, but so did the patterns they revealed. It turns out many women are struggling with similar issues–raw, real, and relevant in our 21st century culture. My friend got the information she needed, but as a bonus, I’ve been able to share what I learned with other women with hearts to share messages that matter. The benefit I received was my own fresh insight into what sisters of today are battling, allowing me to search for answers on their behalf. All because I dared to ask. The second thing I asked for came as a result of requesting detailed and specific aid from my social media peeps. When my latest book, Getting Through What You Can’t Get Over released in late March, it enjoyed a strong opening run. The first 90 days, readers reviewed and spread the word as the message resonated with many who were hurting, or knew someone else who was. But as authors, we know the challenge of keeping our messages out there, and figuring out how to reach appropriate audiences with our words of help, healing, and hope. So when I asked on social media for ideas and/or connections to reach chaplains for the military, hospitals, or prisons, I was again shocked at how much my friends were willing to assist. The power of the ask extended my reach, and the longevity of my book’s impact. In a world that often feels complicated and confusing, with voices shouting, “Try this. Do that,” it’s refreshing to remember the strength of the simple. Lately, I’ve seen many ask for help in a myriad of ways on social media. These days, folks are used to being asked to help with many things. So why can’t we ask for help in sharing our messages, or to find out what messages we should share? Instead of overcomplicating it, why not enact the power of the ask? What are your current hot topics? Do you have any insights on how/who I can spread my message of real healing and hope for the hurting? How can I help you? This entry was posted in Encouragement, Marketing and Promotion, Non-fiction, Publishing, Social Media, Writing and tagged achieving your childhood dreams, Anita Agers-Brooks, anita brooks, chaplains, getting through, getting through what you can't get over, hot topics, last lecture, power of the ask, randy paunch, social media platforms, the last lecture, women's topics by Anita Agers-Brooks. Bookmark the permalink.